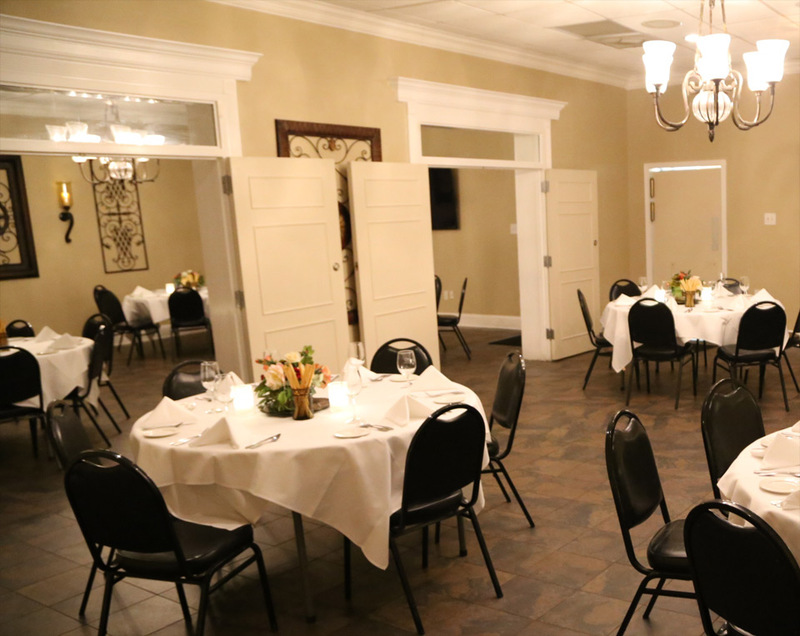 Our beautiful banquet rooms provide the perfect venue for your special party. Each elegant room seats 25 to 50 guests; the double doors adjoining the two rooms can be opened for cocktail parties or receptions for up to 100 guests. In addition to the two main dining rooms, there are two private dining rooms. The elegant dining rooms feature graceful chandeliers for soft lighting, ceramic tile floors, tasteful artwork and cloth draped tables. Host your business meeting, wedding rehearsal, birthday or anniversary party, Bat or Bar Mitzvah at Vincent’s. Each room is equipped with audio/visual capabilities for corporate or family fun presentations. We will open on a Sunday for private parties of 50 or more. Reservations are accepted, as are all major credit cards. We have a small elegant room that can seat up to 22 guest for any occasion. The room is available for lunch or dinner except on Friday and Saturday nights. The entire restaurant can rented for larger parties up to a 100 guest. Our private dining room is available for your next special occasion and can accommodate groups of 15 to 22 people. Reservations are required. This room is not available for private parties on Friday or Saturday evenings. Special accommodations are offered to any group of 40 or more people who would like to be seated between the hours of 5:00 p.m. – 6:00 p.m. Monday thru Thursday. We will provide you with immediate seating at individual tables. Groups joining us during this time may order off of our regular menu or our special groups menu. The choice is yours! These special group arrangements require 48 hours notice and all parties must be seated no later than 6:00 p.m. for dinner. This option is especially nice for tour bus groups or large parties not requiring banquet style seating.